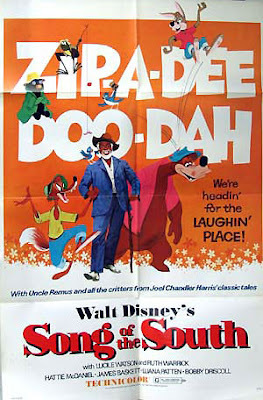 swench: Disney might release "Song of the South"
Disney might release "Song of the South"
Song of the South has always been something of a blemish on the Disney name, due to its racist undertones. However, it can't be denied that the film is a piece of film history. It's got a reputation not unlike The Birth of a Nation, the 1915 film school staple that is widely hailed as one of the most important films of all time on one hand...but could be taken as a recruiting film for the Ku Klux Klan on the other. Song has taken a lot of flack over the years, due to its portrayal of Southern plantation blacks. The film has never been released on video in the United States, and this is from a company that releases, and re-releases, and re-re-releases everything. That may soon change, though. Disney President Bob Iger recently announced that the company has been giving some serious thought to making it available. head over to Cinematical for Iger's statement and more. I've actually never seen this movie.